Using your cell phone during class isn’t a problem at Tidewater Community College if you’re earning your Career Studies Certificate in Programming & Mobile Applications Development. Whether you’re a geek or a grandfather, making your own mobile apps can be a fun hobby or a rewarding career. 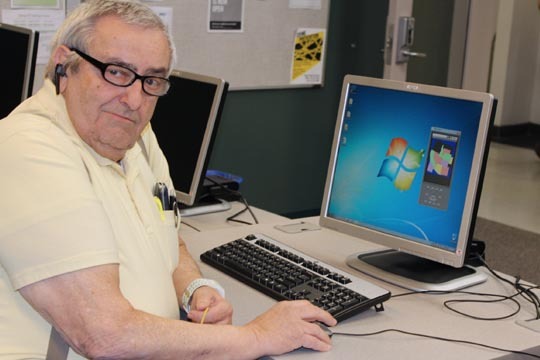 David Scholefield wanted to have a better understanding of apps so he could relate to his grandchildren. Now he’s creating apps that they can use. “Now if I need something done, I can do it myself,” he says, showing off an app he developed in class that turns the map of the United States into a puzzle and encourages children to try to beat the clock fitting each piece in its correct place. Scholefield had previous computer experience, but information technology professor Jared Oliverio stresses no previous design, programming or graphics experience is necessary for incoming students. Students will create multiple apps in state-of-the-art labs that include an emulator that simulates both iOS and Android devices. Each class is four credits. One recently added class that Oliverio expects will fill up each semester is ITP 160, Video Game Design. “Students will get the opportunity to combine programming with video game design and development,” he said. 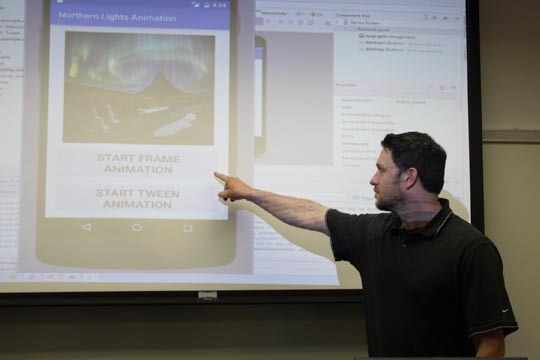 The mobile apps certificate focuses on making the app work rather than making it pretty, said information technology professor Lisa Carter. Students interested in the visual end might consider taking animation or graphic design courses at TCC’s Visual Arts Center. Throughout the course of the certificate, students develop multiple apps and have the chance to advance their interest further through the college’s Coding Club. A recent app soon to be available to all TCC students made by students in the coding club contains office hours and locations for each of the college’s professors. Graduates of the certificate program can find work as entry-level programmers, software engineers and developers and application support personnel. Recent numbers by the Bureau of Labor Statistics show job growth in the field projected at 23 percent by 2023 with earning potential in excess of $100,000. With more than 4.88 billion mobile phone users globally, demand is not likely to dry up any time quickly.